There's a reason why there's so many songs, movies and books written about San Francisco. It's a place so filled with natural beauty that it borders on the surreal. Beaches, parks and landmarks dot the landscape from one end of the city to the other, bracketing a landscape full of culture, art and design. For those who live in the city, there is nothing more coveted than space and a view of the Bay. So when a 3-bedroom, 2-bath condo with commanding views of downtown needs a new look, it's every designers dream job. For design duo Cecilia Sagrera-Hill and George Brazil of SagreraBrazil Design this opportunity went from being a dream to a reality and the result is a gorgeous Bay-area interior filled with custom furniture and California-style. The home begins with an open plan living room and dining room. The cool tones of the furniture contrast with the warm wood tones of the floor. Just past the window lies an expansive deck for communing with the outdoors in person. But even when the outside isn't the most desirable option, the massive windows that wrap around the space offer amazing views of the city below. The dining room adjoining the living room is all about warmth and light. Surrounded by windows, the space is made for enjoying meals while being entertained by bird's eye views of one of the country's most fabled cities. The owners request for custom furniture was followed to great effect in this space which features a unique dining room table consisting of a thick pane of glass supported by eight wooden pillars. The table is attended by four chairs with legs alternating between wooden and upholstered finishes. Separating the space between the living and dining rooms, a wooden credenza echoes the warm tones of the floor, table and chairs. The homeowner's main request was that the residence be completely one-of-a-kind. To that end, every piece of furniture in the home was custom-made in colors that the owners would love. This seating area is a study in neutrals punctuated by warm wood and metallic elements, colorful pillows and global textiles. The sofa is oriented to the window to facilitate long looks out onto the city while reclining comfortably. The main bedroom continues the formula of a neutral-colored backdrop on the walls paired with warm wood elements for contrast and visual interest. The beautiful side tables are the perfect display space for the room's modern lighting. A single royal blue pillow is the colorful highlight of the room against the perfect blue backdrop of a cloudless (though sometimes foggy) California sky. Just like you'd expect in a penthouse overlooking the city, the bathrooms have been designed to create a luxurious spa-like environment for the homeowners and their guests. Keeping things modern and stylish, the bathrooms have been outfitted in a range of small porcelain tiles. The tile keeps the design uniform, extending from the shower wall onto the bathroom floor. While the bathroom is mainly a neutral environment, the design team found a way to bring color home. For a bit of color, this bathroom doesn't sport the typical white cabinetry that's found in most standard spaces. Instead, cabinets beneath the spacious double sinks have just a little bit of blue to them for a colorful touch. In the home's guest bathroom, the tile motif is present once again. Small porcelain tiles extend from the shower down to the bathroom floor. It's the perfect way to establish a wet room feel in a place where guests can enjoy a relaxing hot shower. SagreraBrazil has a relaxed and approachable design aesthetic that's perfect for California living. 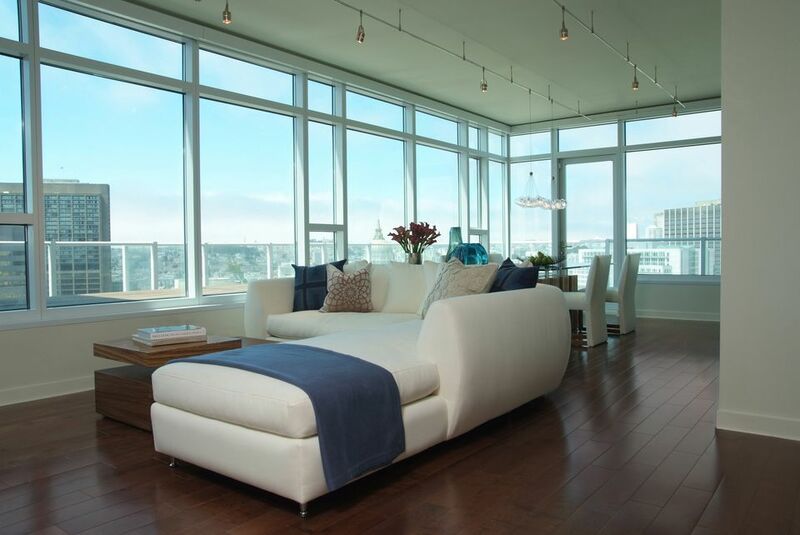 Overlooking the city by the Bay, this space is more than a home, but the perfect urban retreat.